Josh Hawkes shoots at goal from range in last week's home defeat to Guiseley. Matthew Bates has no doubts that talented Josh Hawkes will leave Hartlepool United – but the caretaker thinks a summer move would be too soon for the teenager. Hawkes has been attracting interest from the Premier League, with Newcastle United keeping tabs on the player, while North East rivals Sunderland and Middlesbrough, as well as Leeds United, are also keen. Chris Coleman’s men are in pole position to land the midfielder, having already made contact with the club regarding the player. While their advances were rebuffed, Bates has absolutely no doubt Hawkes will leave Victoria Park to move on to bigger and better things. 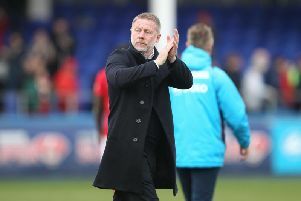 But the manager thinks Hawkes’ immediate career is best served sharpening his tools at Pools, rather than heading off to one of the ‘big club’ academies. “I haven’t seen the speculation, but it does not surprise me. We see it all the time with kids who burst on the scene,” said Bates, who is set to hand the youngster his fourth start for Pools first-team today, when Solihull Moors are the visitors to the Vic. “He will learn a lot if he stays here. “I know he can play higher at some point in his career. “I am always wary of players moving on to bigger clubs too soon. “He wouldn’t play at a bigger club – he will play here. Bates knows just how good the youth product can be, having coached him for the Under-23s this season. Some were still surprised the manager threw Hawkes in at the deep end, during Pools’ fight to stay in the National League. But rather than sink, Hawkes swam. And it came as absolutely no shock to Bates. “He has done well when he has played. His biggest strength is his temperament,” he said. “There is always a doubt when you throw a young lad in. You never know how he will handle the pressure, but he has done well. “He is a confident lad, but in the right way. He has a real chance. A good attitude. “But there is a fine line between confidence and arrogance – I would say that to all young players. Meanwhile, Bates is hopeful that Liam Donnelly will be back this weekend, although he is far from certain to be available. On the Northern Irishman’s fitness, the caretaker said: “We are hoping Liam will train. We’ll have to see how he has reacted to the treatment.